Looking for some warm up the tummy comfort food? 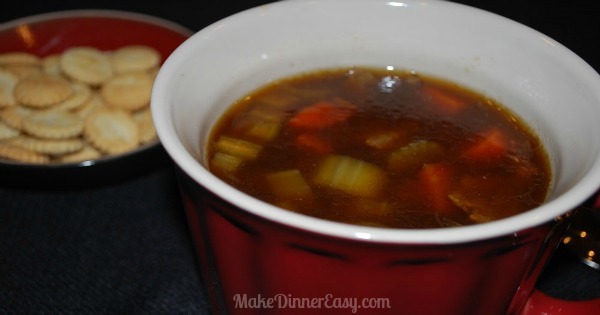 How about this Beef Barley Soup Recipe which can be made easily from leftover roast beef. If you don't have that on hand, you can also brown some ground beef, or slice up some chuck steak. Whatever the source of beef, this recipe is super easy! 3/4 to 1 cup dried pearl barley (more barley will make the broth thicker). 1. Heat the olive oil and butter in soup pot on medium low heat. 2. Add carrot, onion and celery. Add a dash of salt. Cook until vegetables are soft. 3. Add beef, basil, oregano and garlic powder. Continue to cook for a few more minutes. 4. Add a splash of worcestershire sauce. 5. Add remaining ingredients, bring soup to a boil. 6. Reduce heat and cover. Cook for at least an hour to allow the barley to expand and become soft. This beef barley soup recipe is so hearty because the barley adds starch to the broth, slightly thickening it. Also, the beef broth and tomatoes have such bold tastes that it fills the mouth with flavor while it fills the tummy with warmth! 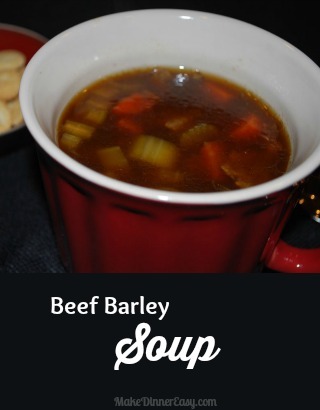 Here are some ideas to vary the recipe a bit, to make your own beef barley soup recipe. -Try different herbs and spices. Sage, marjoram, savory and parsley are all good options. -Like heat? Add some chili flakes, or a splash of Tabasco Sauce. -A few green beans or asparagus tips thrown in 5 or 10 minutes before serving add to the look and taste of the soup.